Finally sharing February’s top picks as decided by you! These were the most purchased items last month and it’s no surprise that the majority of the top ten is items from Amazon! If you missed it, I shared an Amazon haul a few weeks ago including my favorite Amazon finds under $35! An easy to wear pullover that comes in a ton of colors and is under $20! I love that this top has a longer hem, making it perfect for wearing with leggings! Swimsuit season is right around the corner and this top seller from last year is back in some new prints. This suit is oh so flattering and comfortable, with full booty coverage! As much as I am ready for warmer weather, I will be sad to put away all of my teddy coats! 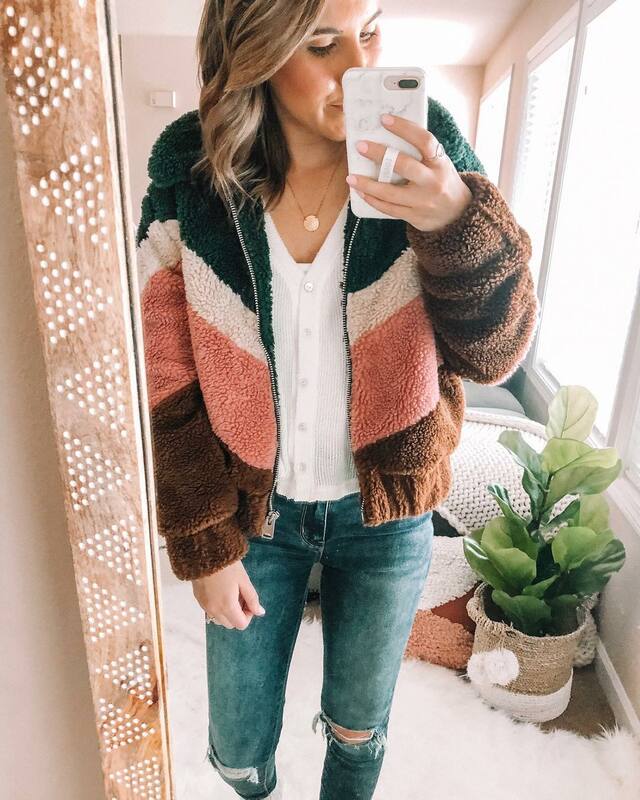 This bomber has a unique chevron design and the color combo gives me serious 70s vibes which I don’t mind. This cutie is currently on sale and one piece you will want to snag for next winter! This cropped distressed sweater is another spring ready piece. It pairs perfectly with high waisted bottoms and a bralette. It comes in a ton of colors, but this orangey pink is even prettier in person! This cozy oversized knit sweater can be worn on or off the shoulder. I love the chunky knit that is surprisingly soft. 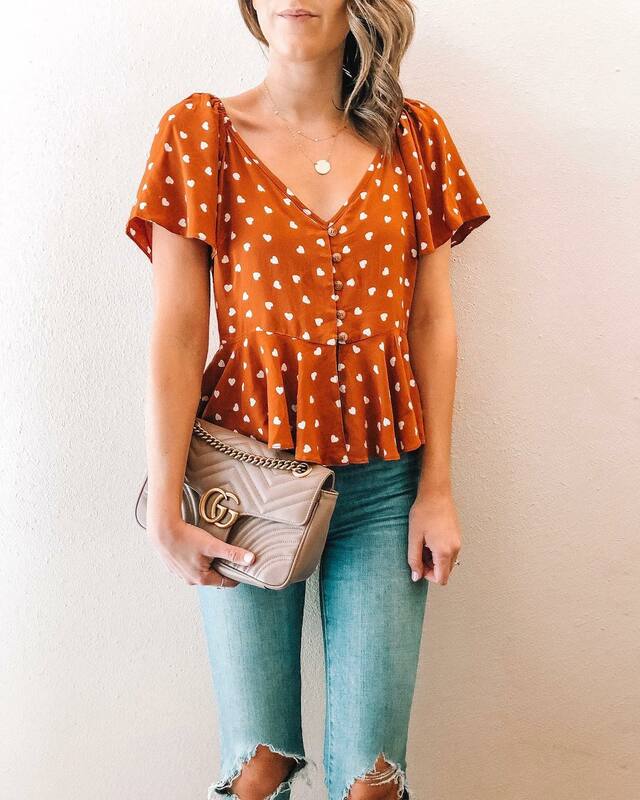 From the heart print design to the flutter sleeves and ruffle hem, this top is SO sweet! The fit is really flattering and I love the hem and sleeves. It’s currently on sale for under $20! This top seller is one of my FAVORITES! I ended up snagging this in a few more colors because it’s a really versatile piece. I love the longer hem and the oversized fit. I’ve been layering it under cardigans and jackets now, but can’t wait to pair it with shorts in the spring! I love the oversized fit of this Amazon find! It’s one of those lightweight sweaters that will be perfect in the summer. Take it to the beach to throw on over your swimsuit or wear it out to dinner and a movie. This sweater looks so cute layered with a pretty bralette! This dress was one of my favorites last summer and I was excited to see it back this year. It’s been in and out of stock this month and is currently out of stock, but keep a look out for a restock. In the meantime, check out this budget friendly option or some of these cute camo finds. A great pair of white denim is a closet staple! 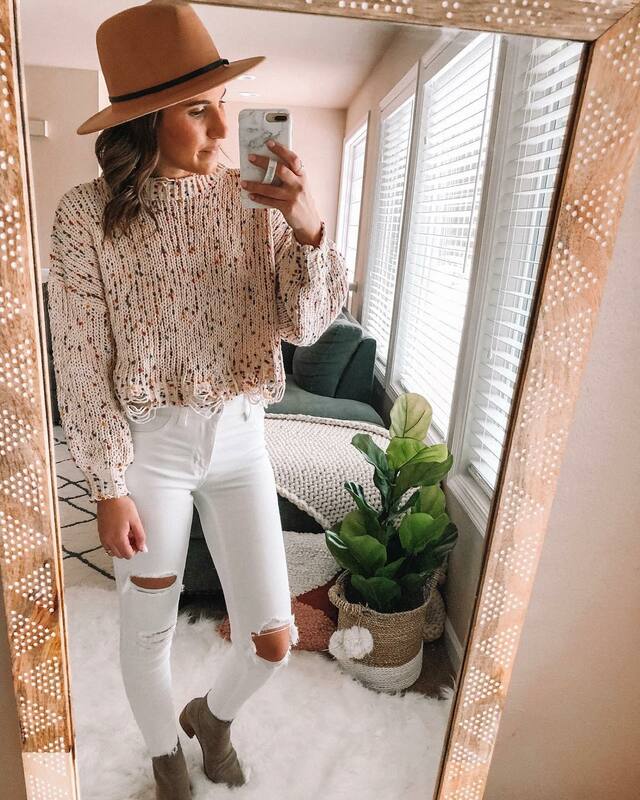 These are hands down the best distressed white skinnies I own! They fit like a glove and I love the distressing and raw hem! I know I will get a ton of wear out of these this spring and summer!